Summer Heats up with Some of our Best Games in 2019! July may very well be our favorite month of the year, if only for the fact that it's the sweet stretch of time where baseball is the only major sport in action. Who doesn't love being the center of attention? Take Fisher Cats Baseball, add three parts Red, White & Blue, shake vigorously then garnish with the biggest fireworks show of the season. Serve on Independence Day. Fisher Cats Baseball is for EVERYONE, period. We'll turn the aux cord over to our players as they set the mood for this night's pyrotechnics. Camp Fisher-Ca-Tawa is in session! Summer campers from across the region will visit Northeast Delta Dental Stadium for a special 12:05 p.m. first pitch and an afternoon of camp-themed fun. 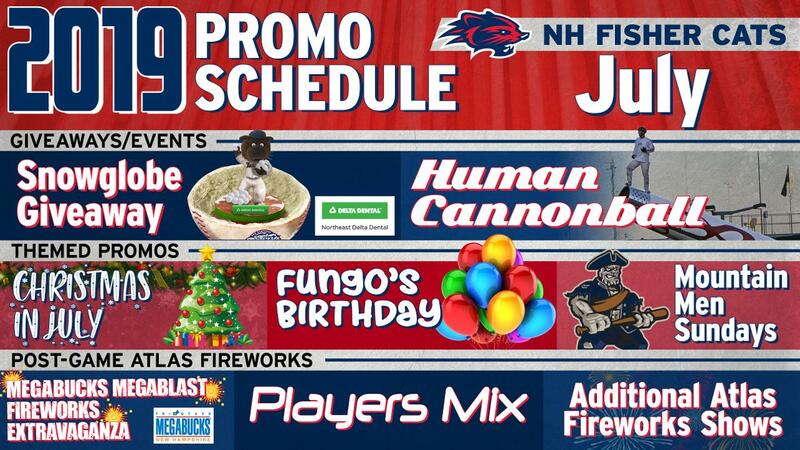 It might be ho-ho-hot in July, but that's not stopping us from calling up the big man during his summer vacation with the missus to put a Yuletide spin on the Fisher Cats Entertainment Experience. The first 1,000 fans in attendance will take home our first-ever Fungo Snow Globe Giveaway! BONUS: The Human Cannon Ball Returns! Stay tuned after the game on the 26th for a spectacualr performance from David "The Bullet" Smith. He's Ferociously Fun. He's the Sultan of Silly. He's… the birthday boy! Everyone's invited to Fungo's 15th Born-Day Bash. Two Tallboy Tuesdays and a pair of Thirsty Thursdays are slated for July. Single-game tickets on sale Thursday, February 14. All promotions subject to change.